Human Pluripotent Stem Cells (hPSCs) comprise embryonic stem cells (hESCs) and induced pluripotent stem cells (hiPSCs). In general, we are interested in how pluripotency might be defined by the epigenome. 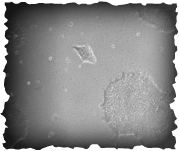 These cells are genetically identical to their differentiated derivatives, yet possess the unique ability to give rise to most other cells. A key question is whether pluripotency is, in part, mediated by a unique epigenomic landscape. iPSCs can aid in this understanding by assessing epigenetic changes during reprogramming and comparing the reprogrammed epigenomic landscape to that of hESCs. Epigenomic Ground State of Human Naïve ESCs. Mouse ESCs are known to exists in a more naïve state than human ESCs. Mouse epiblast stem cells are thought to be the developmental equivalent. We are currently characterizing a new hESC line equivalent to mouse ESCs. Epigenomic Reprogramming of Endogenous Stem Cells. Terminally differentiated cells often exhibit epigenetic abnormalities after reprogramming that can compromise their differentiation capacity. We are profiling adult stem cells before and after reprogramming to determine if a multipotent state results in reduced epigenetic memory.